I hope that doesn't mean you have a cold or the flu. Yum, delish looking dinners! I had a loaded up veggie omelet. Used up some fruits for a side. Ice cream for later. Sure hope you feel better soon, Roch. Grandchildren fill the space in your heart you never knew was empty. We had bowls of "that is so not chili" chili and toasted ciabatta rolls turned into cheesy garlic bread. Thick, NY steaks in cast iron skillet. Salad, bier, and bread. I was told to go to the ER but I decided against it lol (deets in the Sick Room, if you're interested) DH felt bad about asking me what was for dinner, so we ordered Chinese. Not a whiskey person - only have some scotch and bourbon in the liquor cabinet for cooking with. A lot of chocolate bourbon recipes out there! 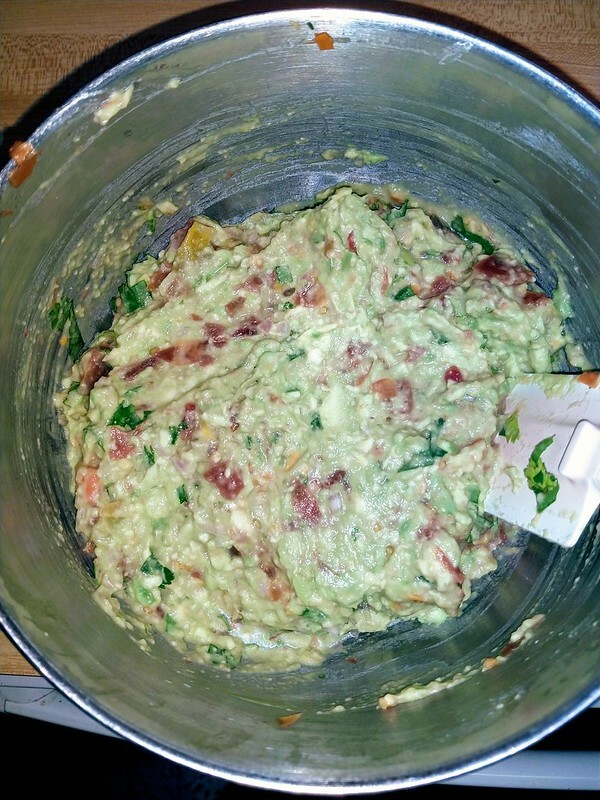 Leftovers today, and the only thing that I made was guacamole, since the avocados were perfectly ripe. And, a friend who likes it was over. The peppers and tomatoes were frozen from last season - still better than anything in the stores. And a small shallot, instead of a half of a small onion - I never keep small onions around. Not a whiskey person - only have some scotch and bourbon in the liquor cabinet for cooking with. Scotch and Bourbon are both Whiskeys. Scotch whiskey is from... um, Scotland. Bourbon is whiskey from Kentucky. I'm going to be a smartarse and point out that it's Scotch Whisky - Scottish and Canadian whiskys; US and Irish whiskeys. I was on my own, so I had a small, rare steak and a chicken wing. DH doesn't like chicken wings and isn't a big fan of "slab o' beef", especially not rare. I had it with mushrooms (he's not so fond 'shrooms either) and a side of rice and corn. Well, you were probably on your own because you are a smartarse. My Hemhorroids Are Killing Me!